Additives are EVERYWHERE. But which are helpful and which are harmful? Giving your body a break from heavy chemicals and irritants in many of the foods we eat and products we use will help to get you feeling vibrant and energetic again. Whether you choose to do a detox program, water fast, juice diet, eat more vegetables or you just want to clean out the pantry — washing your produce thoroughly and limiting non-nutritious pre-packaged foods will help decrease your toxic load. What Foods Should I Be Most Mindful Of? 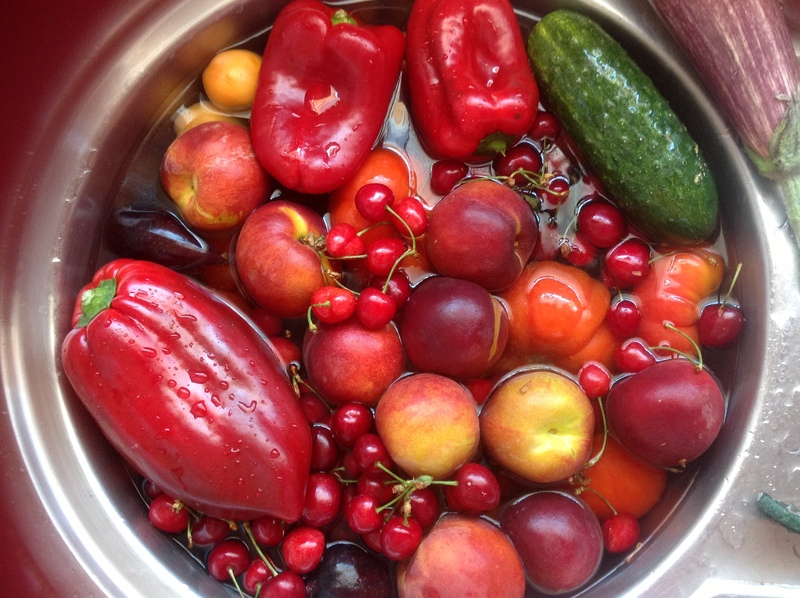 Washing your produce helps to remove dirt and surface pesticides from your produce. It’s especially important to use more than just water on the fruits and veggies we like to call the dirty dozen. When considering buying local, organic and seasonal produce, keep this list in mind. All these produce have a higher percentage of pesticide residues, see the EWG listing for the top produce and pesticide residue data. Even the cleanest produce should be washed thoroughly to limit residues from dirt, multiple handlings, preservatives, waxes, and pesticides. Many of the nutrients in fruits and vegetables are in their skin, including vitamins and fiber. Don’t cut it off, rather start cleaning them properly. You don’t need to spend money on ready-made cleaners, you can easily do it yourself (DIY) with some simple recipes. Spray your produce thoroughly and let sit for 5 minutes before washing off with clean water. Put your produce in a bowl and cover with the Soaking Solution. Let sit for 10-30 minutes before thoroughly rinsing off with clean water. Additives can be hidden in many prepackaged food item and products. The top offending food choices and ingredients are often feared but not understood. To learn more about each additive, continue reading below. In addition to their widespread use in sodas, artificial sweeteners are added to nearly 6,000 other products sold in the US, including baby foods, frozen dinners and even yogurts . It has been suggested that the use of non-nutritive sweeteners can lead to body weight gain and an altered metabolic profile. Although most research is controversial and extrapolated from animal studies, new human studies are emerging. Although non-caloric/ nutritive artificial sweeteners (NAS) have not shown to increase blood glucose levels (except slightly in acesulfame-K) , recent studies show NAS alter gut microbial communities, leading to glucose intolerance, dysbiosis and metabolic disease in both mice and humans [9, 57]. Neurobehavioural tests show high-aspartame diets (25 mg/kg body weight/day) lead to increased irritable mood, more depression, and worse performance on spatial orientation tests . NOTE: A 12-ounce can of Diet Coke contains 187mg of aspartame. To see the average amount of artificial sweeteners in the most common diet soda refer to this PDF. Soda pop (in general) is harmful, especially to children, because of it’s acidic nature that can decrease the amount of Calcium absorption into healthy bone formation and growth . It also increases the risk of calcium-based kidney stones  and dental cavities . For healthier options when it comes to sweeteners, see HERE. Fructose makes up more than 10 percent of the average Western daily caloric intake . The average American consumes 50 g of fructose per day . High fructose corn syrups (HFCS) are 1.5 times more sweet than sucrose and 2 times more than glucose . It is also more soluble in water, making it ideal as a sweetener for drinks and canned fruit [25, 26]. Especially notable in the United States, fructose is added to more than 40% of Western foods and beverages . High-fructose corn syrup and sucrose are both comprised of glucose and fructose subunits. They have similar effects on the body and evidence has linked HFCSto metabolic syndrome and associated comorbidities, implicating fructose as a potential factor in the obesity epidemic [31, 52]. Obesity is a predisposing factor in chronic disease and is associated with a loss in life expectancy. In Canada, having diabetes at 55 years old has a loss of ~5 years in life expectancy . MSG is most commonly known as a food flavor enhancer, especially meat sauces. Surprisingly, monosodium glutamate (1.2g) appears to reduce appetite and hunger but may not affect actual food consumption (some studies showed a slight increase in consumption) . Studies are inconclusive, but there appears to be a preference to crave more starch-type foods after MSG ingestion leading to potential long-term weight gain . Research shows there is a significant increase in headache frequency due to an increase in systolic blood pressure . Other symptoms experienced included muscle tightness, cramps, and fatigue [22, 65]. I find many of my patients have a sensitivity to MSG and get extremely lethargic and sleepy after a saucy and greasy take-out meal. The takeaway: EAT OUT CAREFULLY, AVOID PREPACKAGED FOODS and stick to FRESH PRODUCE. Most people know to avoid trans fats on packaged goods. It’s plastered all over bags of chips and crackers, but what does it really mean? Trans fat stands for trans saturated fats. There are several forms of fat (saturated, monounsaturated, polyunsaturated, etc). The ‘saturation’ describes the chemical formation of the fat molecule in respect to the hydrogen (H)- bonds attached to a carbon backbone. A saturated fat has all it’s H-bonds, no double bonds and creates a linear molecule. Fats that are unsaturated– mono (1 double bond) and poly (2 or more double bonds)– have double bonds which create kink-like structures. The direction of the double bond kinks in unsaturated fats can be -cis or –trans. Cis double bonds occur naturally in many foods we consume: hemp oil, sunflower oil, grape seed oil, egg yolk, almonds, olive oil, coconut oil, etc. Trans double bonds are uncommon in nature. Most are synthetic forms of fats that undergo hydrogenation, which benefits the commercial food industry for its long shelf-life [14, 32]. It has been well researched that trans fats increase the risk of coronary heart disease, stroke, and diabetes, due to their deleterious effect of raising low-density lipoprotein (LDL) and lowering protective levels of high-density lipoprotein (HDL) cholesterol levels . The FDA is trying to mandate labeling of trans fatty acids and is even contemplated banning of it completely on all goods . Learn more about healthy fat options and their cooking temperatures HERE. Olestra was approved by the U.S. FDA in 1996 to replace fats and oils used for the commercial preparation of savory snack food items, principally as a frying medium for potato and corn chips . Olestra is comprised of sucrose with six to eight of its hydroxyl groups forming ester links with long-chain fatty acids. It is not absorbed from the small intestine into blood and tissues and therefore provides no calories to the body . Great right?! Although it is calorie-free and a stable oil for cooking and frying, it has shown to lower levels of fat-soluble vitamins . Olestra decreases vitamin E, vitamin K, vitamin A and carotenoid levels in the body, which are important fat-soluble vitamins and antioxidants . However, supplementation of vitamin E and A seems to help recover depleted levels from Olestra consumption, but not carotenoid levels . There has been a lot of research done on the effects of artificial food coloring (AFC) and the psychological effects on children, especially ADHD. Studies have shown that children with ADHD show excess inattention, impulsivity, and hyperactivity, especially when taking 50 mg or more of AFC . There is also a subgroup of children (with or without ADHD) who react adversely when challenged with AFCs . Three types of potential mechanisms to explore include toxicological, anti-nutritional, and hypersensitivity, with more research needed to be conducted. Read the full article HERE. Toxicology– Large doses of AFCs have shown to create heavy stress on the liver and kidneys and significantly affects measurements of learning, memory, hyperactivity and decrease exploratory behavior . Hypersensitivity– AFCs are sometimes referred to as haptens because of their low molecular weight. Haptens can cause immune reactions when bound to a large carrier molecule, such as a gastrointestinal protein. Triggered mass cells can release granules and cytokines, which often result in an allergic response. Certain AFCs can cause both allergic and non-allergic reactions, such as migraines, eczema flairs, inflamed gut and nausea . Anti-Nutritional– Certain AFCs appear to chelate zinc which is the critical cofactor in the metabolism of neurotransmitters, prostaglandins, melatonin, and indirectly, dopamine . Even marginal zinc deficiencies can lead to oxidative stress . Natural food dyes can be made with beet juice or beetroot powder, chlorophyll, red cabbage and many more. Get creative. I’d love to hear about your successful food color challenge. It is commonly believed that chronic excessive use of table salt (NaCl or Sodium chloride) leads to high blood pressure and heart disease. It is now evident that this is specific to a population with salt-sensitive hypertension, which makes up 2/3 of essential hypertensive patients over 60 years old [7, 48]. However, chloride has actually been shown to have protective cardiovascular effects . So what’s so bad about salt? Well, NaCl does cause a redistribution of fluid from within the cells to its extracellular matrix (ie. increase fluid volume and resistance in the blood) due to osmolarity. It also increases arterial constriction and peripheral vascular resistance . So, someone currently exhibiting high blood pressure, arteriosclerosis, salt-sensitive hypertension or a deficiency in the ability to excrete sodium via the kidneys is at high risk of suffering a stroke and heart condition [7, 64]. In general, Western diets consists of excessive amounts of salt in our foods, especially processed and should be used in moderation . Also, renal calcium reabsorption (calcium being reabsorbed back into the body via the kidneys) is directly proportional to sodium reabsorption. Which means that with an increase in NaCl consumption there is less reabsorption of sodium, leading to a parallel reduction in calcium reabsorption . Children and post-menopausal women are most affected by a decrease in calcium reabsorption for bone density health . Along a similar pathway, people with calcium-based kidney stones will be exasperated with high sodium intake . Finally, iodine from iodized salt is important to regulate the thyroid hormone levels. However, chronic iodine excess can lead to autoimmune thyroid conditions, such as hypothyroidism, thyroiditis and iodine-induced hyperthyroidism . Sodium sulfite is a common inorganic salt used in cosmetics and aerosol hair products [58, 35, 44]. As well, they are currently used for a variety of preservative properties in food, beverages and pharmaceuticals for controlling microbial growth, preventing spoilage, and bleaching some foods [58, 35, 44]. Sulfites that are ingested, inhaled, or injected are rapidly metabolized by sulfite oxidase to sulfates [44, 23]. High doses of sodium sulfites have been shown to aggravate and cause inflammation the airway and gut mucosal lining . There is a portion of people who are sulfite sensitive and react very poorly with oral consumption and even topical applications [41, 61]. Sulfite hypersensitivity is especially prominent in the population suffering from chronic asthmatic (5-10%) with symptoms ranging from asthma attacks, dermatitis, urticaria, angioedema (swelling), hypotension (low blood pressure resulting in dizziness or fainting) abdominal pain, nausea, diarrhea, seizures, and anaphylactic shock[41, 61]. There is a lot of confusion when it comes to sodium nitrates since it is found abundantly in many nutritious vegetables (ie. beetroot, spinach) and has been used successfully in vascular therapy. So then how can it be toxic and cancer-promoting as a preservative. Are these the same molecules? Surprisingly, YES… let’s see why they affect the body so differently. First off, the salivary and digestive conversion of nitrate to nitrite and then nitric oxide (NO) appears to be a critical determinant of the effects of nitrate . Salivary interaction along with digestion actually acidifies nitrites, which become bactericidal for a variety of gastrointestinal pathogens such as Yersinia and Salmonella . Green leafy vegetables, high in dietary nitrates, also contribute to cardiovascular health by augmenting nitric oxide status, an important vasodilator and anti-inflammatory agent [18, 43]. This is the same mechanism of action for sodium nitrite therapy, which is an effective treatment of vascular aging, peripheral artery disease and diabetes [18, 43]. Inorganic nitrates are precursor molecule for augmenting nitric oxide circulation and tissue bioavailability to reduce oxidative stress and inflammation [18, 43]. Sodium nitrates are also used as a preservative to give meat the ‘pink’ color . Processed (red) meat was observed to increase the risk of type-2 diabetes mellitus, chronic heart disease (CHD) and moderately elevated stroke risk when studies compare processed and fresh meats . “In fresh, undamaged vegetables, the nitrite concentrations are usually very low. Under adverse post-harvest storage conditions, nitrate concentrations in vegetables increase as a result of bacterial contamination and endogenous nitrate reductase action. Nitrite accumulation in vegetables is inhibited under frozen storage because endogenous nitrate reductase is inactivated. Pureeing releases endogenous nitrate reductase, increasing nitrate concentrations in vegetables. Oral reduction of nitrate is the most important source of nitrite. In order to maximize the health benefits from eating vegetables, measures should be taken to reduce the nitrate and nitrite exposures while maintaining the recommended vegetable intake. Excessive use of nitrogen fertilizers should be avoided so as to reduce nitrate buildup in soil or vegetables. Vegetables must be stored and processed properly to prevent bacteria contamination. Removal of stem and midrib results in a decrease of nitrate content in lettuce and spinach. Peeling of potatoes and beetroot decreases the nitrate content. Nitrate levels in some vegetables can decrease after cooking in water or blanching” . High oral doses of sodium nitrites can be life-threatening, as seen in people who accidentally ingest antifreeze . Infantile methemoglobinemia, carcinogenesis and possibly even teratogenesis (fetal death in utero) have been reported after sodium nitrite poisoning . Methaemoglobin is unable to bind oxygen and causes hypoxemia (lack of available oxygen) . Infants under 3 months old are particularly susceptible, while adults are not thought to be at risk of vegetable-borne nitrate or nitrite-induced methemoglobinemia . Home prepared infant food containing vegetables should be avoided until the infant is 3 months or older . BHA, BHT, and propyl gallate have been used as synthetic food antioxidants to prevent oils, fats, and shortenings from oxidative deterioration and rancidity . The shelf-life of products is estimated to increase 15-200% with the addition of these antioxidants . At a low level, these chemicals appear safe. Given that people consume nowhere close to the levels that induce toxicity, you would think that there is no concern for these synthetic antioxidants. In fact, there is some potential for synthetic antioxidants can actually prevent cancer . There does appear to be an increasing concern for the chronic toxicology and side effects of these additives . Most of the research so far has been performed on animals, which means the results may not be the same for humans. At high levels, a number of animal studies have reported teratogenic and carcinogenic effects . However, a human study of over 120,000 men and women showed no significant correlation of BHA and BHT to stomach cancer after a 6.3-year follow-up . The bottom line is that it’s always wiser to avoid preserved foods and cosmetic oils if you have the option, but you don’t need to live in fear of BHA, BHT or propyl gallate. More human research needs to be performed before any clear decisions can be made about these synthetic antioxidants. Sulfur dioxide (SO2) is an air pollutant gas primarily emitted from fossil fuel combustion at power plants and other industrial facilities, as well as fuel combustion in locomotives, ships, and other equipment . SO2 has also been used as a food additive in dried fruit, fruit juices, soda pop, alcohol, hamburger meat and breakfast sausages [47, 54]. In vitro animal studies show sulfur dioxide (SO2) in vascular smooth muscle inhibits cell cycle proliferation (replication) and reduces DNA synthesis . Vascular smooth muscles make up the middle muscular layer of arteries and veins, tunica media. It has an irreplaceable role in vascular and fetal development . If the cell proliferation cycle is interrupted, there are severe implications for vascular diseases such as hypertension, diabetes, atherosclerosis and restenosis (reoccurring narrowing of blood vessels or stenosis) after rapid response to blood vessel injuries . But please keep in mind that this is research has not been performed on humans, so interpretation is projected from the animal study. Similarly to sulfite hypersensitivities, SO2 is well-known to trigger IgE sensitivity reactions, especially asthma attacks [50, 54]. Sodium dioxide additives should be avoided or limited in hypersensitive and asthma patients. Potassium bromate (KBrO3) is widely used as a food and cosmetic additive and is a major by-product of water disinfection processes (ozonation of bromide-containing water), so is therefore frequently detected in tap water [3, 37]. KBrO3 is added to beer, cheese, flour as a maturing agent and fish paste as a conditioner [2, 3, 37]. It is an ingredient in cold wave hair solutions, used to clean boilers and oxidation of sulfur and vat dyes . It has been shown to cause nephrotoxicity (kidney damage) and oxidative damage in human and experimental animal studies . In vitro results show that KBrO3 induces oxidative stress in human erythrocytes (red blood cells) through reactive oxygen species (ROS) generation and alters the cellular antioxidant defense system . Studies have also found a correlation between the urinary bladder and colon cancer and the chronic consumption of surface waters containing KBrO3 by-products . Accidental poisonings from cosmetic products containing bromate have occurred with the most common signs being severe gastrointestinal discomfort, central nervous system dysfunction, anemia, renal injury and hearing loss . Parabens are EVERYWHERE. Most commonly, they are used as an antimicrobial preservative, mainly in personal care products, pharmaceuticals, and food [8, 34]. Processes of preserving confectioneries (foods rich in sugar and carbohydrates) and dried meat contain higher levels of parabens . Parabens are found in deodorants, toothpaste, mouth washes and shower gels,and also in consumer products such as cleaning products, plastics and toys . In addition, paper sources are a major contributor for dermal absorption of parabens– paper currencies, tickets, business cards, food cartons, flyers, and newspapers, but the most notable amounts were from sanitary napkins . A Swedish study found parabens were higher among the children in urban areas compared to rural and were associated with the use of cosmetics and personal care products . Parabens are easily absorbed orally and to a lesser extent dermally (through the skin) . After absorption, parabens can be hydrolyzed, conjugated and excreted within hours . Despite their short half-life, spot urine samples can indicate paraben exposure over several months . Parabens are weak xenoestrogen and scientific reports are concerned with the potential endocrine (hormone) disrupting effects and link with breast cancer [8, 33]. More studies are still needed to find the long-term effects of frequent paraben exposure. To learn more about what ingredients to avoid, please read the Evaluation of Certain Food Additives and Contaminants reported by the WHO here. This article is shared with permission from our friends at dralisonchen.com.